I tell people I don’t read reviews. That’s not *totally* true. It is true that I don’t hunt them down–usually my editor will send me the important ones. I have Google Alerts out for things like “Alethea Kontis” and “AlphaOops” in case someone invokes my name and it’s appropriate for me to share a little love and thanks. Sometimes folks will post reviews on my FB wall, and I feel rude not at least checking them out. They went to all the trouble to read the book, after all. But I don’t go to Amazon, unless I’m snagging a link for one of my books. That number on the screen there is about as “rank” as old Irish cheese. I worked in the industry; I know how little that number actually means. I don’t care if I’m #13 bestseller in Young Adult—>Fairy Tales—>Enchanted Frogs. In the grand scheme of thing, it doesn’t make a hill of beans. To me, anyway. And come on, guys. I write reviews. I know how incredibly subjective they are. I never dissuade someone from reading a book just because it wasn’t my cup of tea. Perhaps my bar is just set a lot higher. My milestones are farther out. Oh, I still have my little wishes: to get a starred review (done), to be in an Ellen Datlow anthology (not yet), to win an award of some kind (not yet), and things like that. Not looking for reviews does have a downside, like when I finally scrolled down on Amazon and noticed the woman that had posted a review saying how AlphaOops was pretty much responsible for getting her reluctant son to read. I was so honored I cried that day. But I don’t avoid reviews like I’m in an anonymous program or something. I’ll read it. If it’s horrible, I’ll just make sure they spelled my name and the title correctly. (That, and the correct ISBN, are actually the most important parts of a review. Did you know that? Right now, what’s making me so excited is all the people who are posting about how much they can’t wait to read ENCHANTED. That is AWESOME. 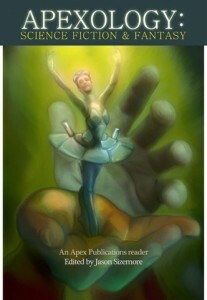 It’s also a treat for me when I’m singled out during reviews of anthologies. I do a ton of anthologies, so there’s no way I could hunt down all the reviews even if I wanted to…but sometimes they are brought to my attention. Fir instance, I was scanning through the July issue of Locus to find pictures from the Nebula awards, when I saw a cover that I recognized and stopped. 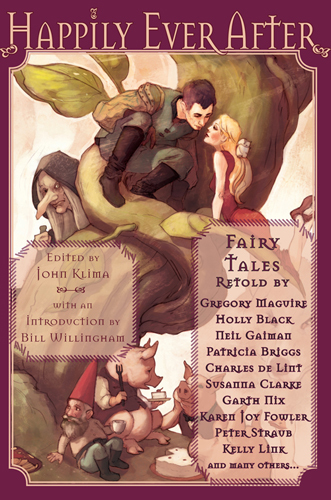 I was honored to have been part of John Klima’s reprint fairy tale anthology Happily Ever After, but this one sentence made my day: “‘Blood and Water’ by Alethea Kontis retells ‘The Little Mermaid’ with the kind of direct force that Datlow and Windling made something of a specialty.” Yes, indeed, that totally made my day. Being “another story of note” is definitely a step up from “and many other fine stories.” Remember those little milestones I was talking about? This is one of them. This entry was written by Princess Alethea and posted on September 23, 2011 at 9:15 am and filed under life, Reviews, Short Stories, writing. Bookmark the permalink. Follow any comments here with the RSS feed for this post.